Students develop critical thinking skills when analyzing their laboratory data. The Biochemistry Specialist Program is academically oriented and designed to provide students with a fundamental understanding of the theoretical and practical aspects of the discipline. The program offers training in problem solving specifically using a molecular approach. Biochemistry specialists will gain experience in critical thinking and the skills to evaluate scientific rationale. The acquisition and integration of new knowledge in biochemistry and related disciplines. The development of practical laboratory research skills, including the ability to carry out a variety of modern biochemical procedures, experimental design and data analysis and evaluation. The development of critical thinking and problem-solving skills. The ability to access, critically analyze, and summarize scientific literature. The improvement of both written and oral communication skills. The ability to interact constructively both with peers and faculty, showing clear evidence of positive teamwork and leadership within group dynamics. An appreciation of the contributions of the many interactive disciplines of Biochemistry and their place in current research. The preparation of students for post-graduate careers and further education, including entry into the workplace, professional schools and graduate school. One of the advantages of the Biochemistry Specialist Program is that it gives students access to smaller classes and the chance to interact with faculty. There are also several excellent courses that are open to Biochemistry Specialists and students in closely related programs (Immunology and Molecular Genetics & Microbiology). These courses include the full year biochemistry course in second year (BCH242Y), the honours level lab courses in third year (BCH377H, BCH378H), and the third year lecture course BCH340H. 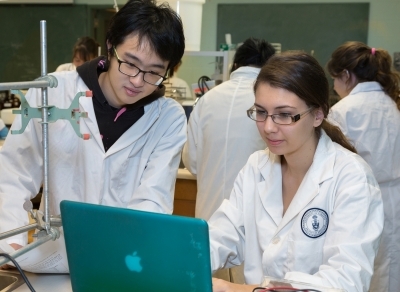 Biochemistry Specialist Students also take MGY311Y and may take a 300+ level IMM course. Class sizes are usually much smaller than those found in generalist programs and there is considerable interaction between faculty and students. The Advanced Biochemistry Laboratory course in fourth year (BCH478H) is restricted to students in the Biochemistry Specialist Program. The “advanced lab” course is one of the best biochemistry laboratory courses in the world. Specialists in Biochemistry also have access to a number of research project courses (BCH372Y, 374Y, 472Y, 473Y) which give further excellent opportunities for research training and the enhancement of laboratory skills. For more information about the Biochemistry Specialist Program click on the links in the right-hand margin of this page. The Biochemistry Undergraduate Student Society (BUSS) is a useful resource for the student perspective of our program.